Daniel Parsons, welcome to Author Spotlight. I’m sure we are all interested to know more about you and your books. I hear you have a new book out all about Twitter. I must buy it as Twitter is a mystery to me! Daniel Parsons is the author of the fantasy books The Winter Freak Show and Blott as well as the comedy zombie story Necroville which has received critical acclaim on Wattpad, garnered almost 30,000 reads, and has been used to promote Hollywood’s Pride and Prejudice and Zombies movie. 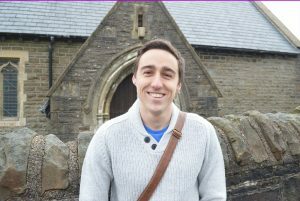 Besides writing, Daniel has worked at two publishing companies in South Wales, UK, but now works as a freelance editor. He occasionally runs workshops in which he teaches other authors how to grow an effective social media presence, having amassed over 90,000 followers on Twitter himself. His first non-fiction book The #ArtOfTwitter – a Twitter guide for writers, musicians, artists, and other creative professionals – is available now having been published on August 22, 2016. If you want to know more about Daniel, sign up to his mailing list or follow him on Twitter (@dkparsonswriter). He loves talking to readers, writers, and anyone else who will listen! That’s a very good question, and something I ask myself frequently because my reason for it keeps changing. For me, the creation process has always enticed me. Reading and writing were some of my favourite hobbies as a child. I started writing at about nine years old but it wasn’t until university that I finished my first novel (which was never published) and discovered self-publishing – which I loved. Nowadays I write because it’s one of the few professions in which you can work how you want, where you want, and when you want. There are no office hours and there is no such thing as an average day. If you do it well, you can earn money when you sleep or when you’re travelling, and your income is almost endlessly scalable. In my opinion, writing is a hobby I love and a means of achieving my perfect lifestyle. It’s a way of life! Right now I’m in the early stages of a comedy zombie novel. A while back I wrote a short story called Necroville which was about a group of teenagers who visit a fake zombie experience facility then find themselves caught in a real outbreak. It received rave reviews on the story-sharing site Wattpad and was used to promote the Pride and Prejudice and Zombies movie. So many people asked me to write something else in that universe so I’ve plotted the novel-length sequel I’m working on now. It should be out sometime early next year. I haven’t actually told anyone the plot of my Necroville sequel, and I won’t give away too much here either. All I’ll say is that I’ve spent a few years working part-time in a bar (as most creatives do as some point). While there, I’ve seen a lot of fights and alcohol-fuelled drama and confusion, some of which is hilarious. My latest book explores that theme. Just imagine the chaos of a zombie outbreak. Now imagine tackling that pandemonium when you and your friends have had a few drinks. The result is a cocktail of terror and comedy. Hopefully my readers will lap it up! Without a doubt one of my favourite authors – as a boy and still today – is Anthony Horowitz. I was introduced to his Alex Rider teen spy series at the age of twelve and I remember being completely absorbed by the action. I desperately wanted to read on but had to pace myself because I didn’t want the series to end. That’s how I want readers to view my books. Fun should be at the heart of every story I write. Of course there have been other authors that influenced my fiction. Terry Pratchett, Derek Landy, Michael Grant, and Darren Shan all deserve honourable mentions. Together, they have shaped the writer I am today. Carrie by Stephen King. These days I read books to learn as much as for fun. King is known as the master of horror and I can see why. Last Christmas I received his book On Writing which I would recommend to all writers. It taught me loads, and so has Carrie. The word choice and the way the book is constructed all work together to build an eerie atmosphere before anything scary even happens. It’s fantastic! I outline my stories meticulously before I write a single word so I never get stuck in the middle of a book. The only time I get bogged down in indecision is between projects. The last time this happened, I had a few ideas for new books but none really stood out for me. In the end, I spent a few days devouring as many books and watching as much TV as I could to search for inspiration. Eventually, that inspiration struck when watching a documentary. Tweaking one of the projects so that it incorporated that new idea gave me the enthusiasm I needed to kick-start my writing again. At the moment I have two frustrations. As a self-published author you’re always told that you need to release several titles per year if you want to be successful. This in itself is achievable… if you don’t have a day-job. Like most authors, I do have a day-job as my writing doesn’t fully support me financially yet. What that means is that I’m able to pay for editors, cover designers, and marketing to ensure that my books’ quality is competitive, but I don’t have enough time to write prolifically without risking burnout. Giving up the job would give me the freedom to write more but I wouldn’t have enough money to get the books produced and advertised professionally. It’s a vicious circle but one that I’m hoping to work my way out of pretty soon. I think building a mailing list is crucial for getting early reviews as you can give away review copies to your list ahead of book launches. That’s what I’m working towards as I know several authors who generate hundreds of online reviews within a few days of releasing books by using that process. If you don’t have that sort of influence yet, though, I would recommend joining a Facebook group in which authors read each other’s books and exchange honest reviews every month. Providing the authors are honest, I believe that’s a good way to get started and keep your integrity. It’s helped me a lot. I’m a massive advocate for social media. As of today, I have 93,000 Twitter followers – an audience that has taken four years to build. My followers are extremely active and have been fundamental in my growth, providing me with advice and reviews, as well as helping me boost my influence on Wattpad. They’ve really been a driving force of help and encouragement. 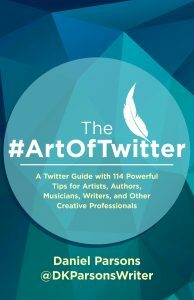 I love Twitter so much that it led me to write The #ArtOfTwitter which is a Twitter guide for creative professionals who want to achieve the same as me. So many people have asked me how I got my following and I knew I couldn’t fit my answer into a short conversation or blog post. That’s why I wrote the book. My family are very supportive but they aren’t really my demographic. As for my actual readers, there was a lady I met about a year ago at a writer’s group. The group had read my children’s fantasy book The Winter Freak Show and had invited me as a guest author to answer questions. There I met a lovely lady who was heavily pregnant at the time. A month or two later, she contacted me on my Facebook page and told me that she had given birth to a baby boy that she named Toby – after the hero of my book! That was the biggest compliment I’ve ever received so I’d have to give the title of “biggest fan” to her. For me, life is all about experiences. I’m a keen traveller and adrenaline junkie. While I’ve done a fair bit of travelling and extreme stunts already, I’m not even close to visiting all the places and doing all of the things I’d like to experience. A skydive is probably my next move. That’s been on my list for a few years now. This year I’m making good ground when it comes to my paperback books. I’ve just agreed a deal that will make my books available to UK-wide bookshop chains, starting with The #ArtOfTwitter. They won’t be stocked directly in the stores yet, but you will be able to request them at the counter of almost any big chain and expect to see them delivered within a few days. If you live in the UK and want my books then try asking for them in a month or two. If I generate enough interest then my books may get stocked on the shelves eventually without you having to ask. It’s all about word of mouth. The next novel sounds fascinating as does the Twitter book. Thank you so much for ‘appearing’ on the Author Spotlight series. It was interesting and I am pleased to have got to ‘meet’ you! If you enjoyed this interview please consider ‘Liking’ the ‘Author Spotlight’ Facebook page. Maybe you are an “indie” author and would also like to be featured here? Leave a comment below and I will get back to you.